Perfect for the couple that wants a unique place to stay, walk to everything! Want to experience what it was like to ride in a Pullman car while crossing this great country of ours? 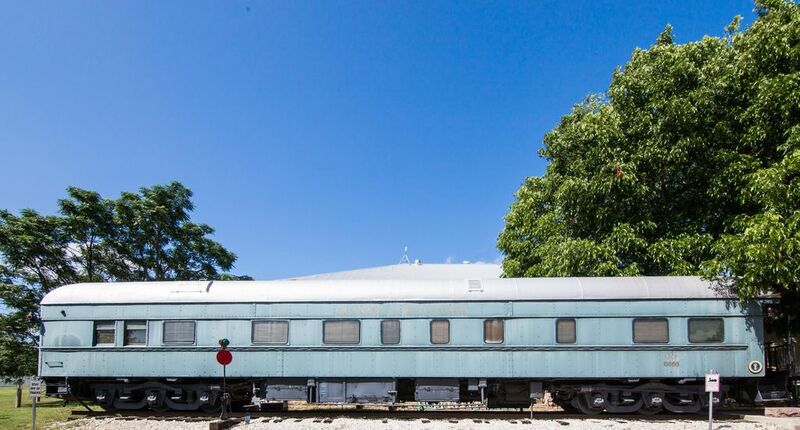 The 1894 Private Palace Pullman Car will give you that feeling and more! Theodore Roosevelt used this car on one of his trips to the 6666 Ranch in North Texas. It is believed that the Indian Chief – Quanah Parker has also ridden in this unique Pullman Car. History surrounds you in every nook and cranny. This wonderful antique train car was built in 1894 by Pullman for the Quanah, Acme and Pacific railroad. Not only is the car historic, but it is very Romantic and perfect for a 'Just the Two of You' Getaway. Just 3 short blocks from main street! Shopping, Eating and wine tasting! What a nolgastic place to stay at! So much history inside the train. Truly enjoyed reading the book “Theodore Roosevelt’s Letters to His Children”! Located walking distance to all the shops on Main Street. Couldn’t have picked a better place stay at for our 15th wedding anniversary. Unique accomodation in a great location! Wish we could have stayed longer in this nicely decorated rail car. Within a few minutes walk of restaurants and the main street shopping area, it couldnt be more convenient. We'll stay here again! fun stay! great job preserving the history. a little bit like Glamping. great location. fun to play cards in the sitting room. lots of great artifacts, antiques and books. Had a great stay at the Four Sixes Rail Car. Very unique and enjoyable experience. Highly recommend for couple’s getaway. I reserved this for a surprise weekend for my fiancé. I wouldn't tell her where we were staying despite her asking many times. Then when we drove up she had this strange look on her face like "We are staying on a train?" We then walked in and she just couldn't stop saying how cool this was. It was a very unique experience. We entered the room to a personal welcome from the owner along with a gift. There was so much history and nostalgia in the car you could spend a great deal of time just looking at the artifacts as if you were in a museum. It was like sleeping in a museum. The queen bed was very comfortable. The butler's kitchen was just right for mixing drinks, making coffee, etc. This was a very unique and interesting place to stay and I would highly recommend it for anyone looking for something outside the norm. It is an experience we will remember forever. One note is this property is not handicap-accessible and I would not recommend for such. Hospitality and history close to everything! Really a lovely little place to stay if you're wanting to experience some rich Texas history, with the added benefit of being close to Main Street and many other cool places in Fredericksburg. We loved learning the long, interesting history of the Pullman car. Also loved the many amenities and treats from the host. The only thing missing was the swaying of the car back and forth on the tracks!